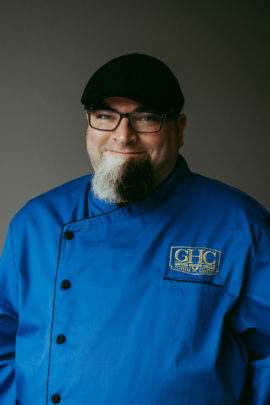 Meet Blue Coat Chef Jason. He has been a valued member of the Blue Coat Army since 2016. Jason got his formal training in culinary school, but it was his mom that inspired him to become a chef in the first place. He loves cooking comfort food, but he absolute favorite food to eat is sushi! Jason has worked for many popular restaurants, but he attributes his success and happiness with Greek House Chefs because of how much the owners really care about their employees. Besides feeling like the valued team member that he is at GHC, He loves the praise and compliments he receives regularly from his chapter house and says that a little note, or a simple thank you makes it all worth it day after day.